Oh goodness, they’re here already? Yup, you guessed it. It’s time to put out the nectar feeders and welcome those little emerald darlings on rapidly beating wings. 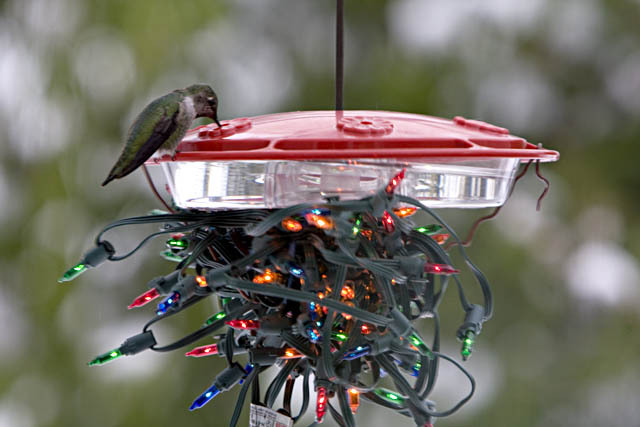 The ruby-throated hummingbirds. As of yesterday, April 16, the map showed they’ve arrived in Rhode Island, or the corner of Massachusetts. It’s hard to tell but it doesn’t matter, they’re almost here and Mother Nature has yet to put out the welcome mat. Last night’s temperature dropped below freezing which means nectar water might freeze. 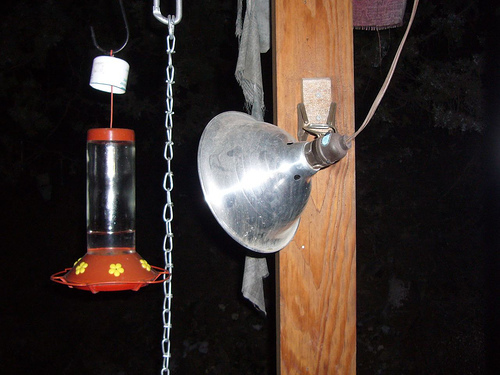 Perhaps I should install blow torches at each feeder. 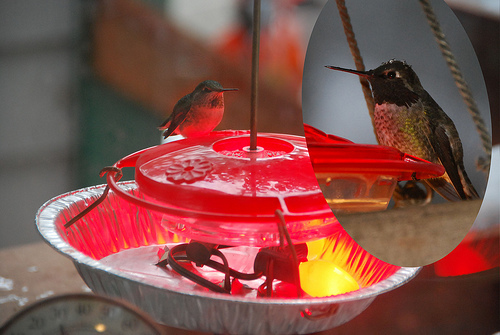 I’m not worried about the birds getting, what is called perch hypothermia, as I am that the nectar will become a block of ice and the hummingbirds won’t get any food at all. Plenty of people have the same concerns that I do and, of course, companies have answered the call. This heater can be purchased on Amazon for a mere $60.00. 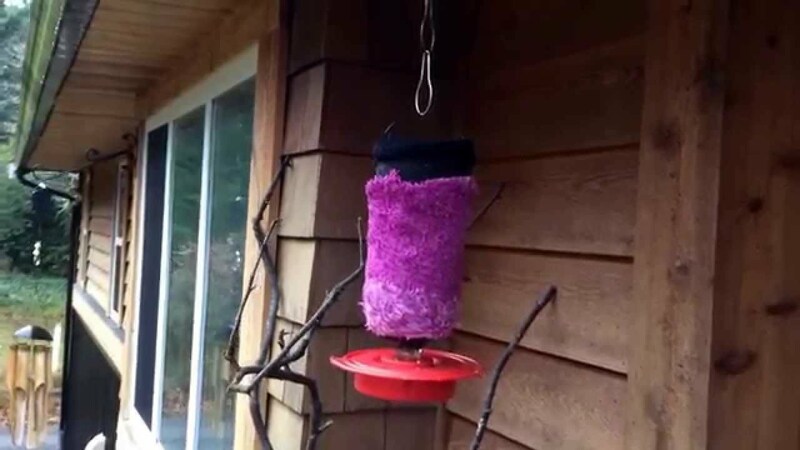 Some folks are more ingenious with their DIY nectar-feeder heating techniques. I’m not sure I have to stoop to such drastic measures. Even though the nighttime temps are dipping below freezing the daytime temperature is hovering above forty degrees. Hopefully Mother Nature will decide to bring some warmer weather to New England by the time May arrives. If not, well, I might be staring at a garden that looks like this all season long. Or maybe not. I needed to get things in to perspective so I went into my archives and found these photos from last April. As of April 30, the yard was flooding. My peony bush, late April, 2017. My peony bush as of April 16, 2018. That year the Mother’s Day storm dumped close to 20 inches on the Boston area. Maybe I shouldn’t have put my snowblower away just yet. Sigh. Gallery | This entry was posted in Life on the Concord River and tagged blog about life's changes, blog about life's journey, blog about New England, Boston blizzard May 1977, can hummingbirds freeze on feeders, Does it snow in May, feeding hummingbirds in cold weather, hummingbird feeder heater, hummingbird migration maps, inspirational blog, is spring late this year, keeping hummingbird feeders warm, nature blogs, nectar heaters, perch hypothermia, ruby-throated hummingbird migration, snow blizzards in May, snowstorms in spring, springtime in boston, springtime snowstorms. Bookmark the permalink.